Ah, Lync Mobility... My favorite topic. According a leading research center, #1 cause for ulcer among Lync administrators is deploying Mobility. Just kidding... about the research. The rest is true -you just take a look at the TechNet forums. Today I decided to take another look at the Mobility subject and attempt to clarify some of the major misconceptions surrounding this particular Lync/Skype4B server modality. Like any other SIP endpoint, Mobile apps use SIP signaling to sign-in, send and receive IMs, and/or negotiate voice/video calls. However, unlike the rest of the family, this SIP signaling is encapsulated, for lack of better word, within SSL (HTTPS) traffic. So, while the so-called “fat client” connects to the SIP server service directly, Mobile client does so via the UCWA virtual web site, and then proxies to the SIP Service on behalf of the endpoint. When it comes to media, P2P or a meeting, the above still applies (the call setup), but media flows exactly as it would between two "normal" clients. That is, if the Mobile client is on Internal Wi-Fi and the other endpoint (desktop or Mobile) is on the same internal network, the media would flow Peer-To-Peer. If the Mobile endpoint is on the public Internet and the other endpoint is on the internal network, the Mobile endpoint device would use the Edge server in the deployment. This holds true if the Mobile endpoint device and the other endpoint are both on the Internet. Media will flow P2P or via the Edge server, depending on the endpoint’s physical location. Beginning with Lync 2010, a new service was introduced: lyncdiscoverinternal and lyncdiscover. This (DNS) record has become the preferred method to discover Lync registrar services across all clients. However, there is one very important difference between Desktop and Mobile clients - while desktop client have a built-in DNS fallback mechanism, mobile clients work only with the auto discovery service and, if auto discovery is not available or not working correctly, mobile sign-in will fail. Note that while the pool FQDN is pool1.skypeuc.com, the Internal web site is webaint.skupeuc.com and the External web site FQDN - webaext.skupeuc.com. As discussed in the previous article, based on the which web site client query, the infrastructure will respond accordingly. Clients will first query DNS for lyncdscoverinternal.contoso.com. If the record is present, (all) clients will attempt to connect first using HTTP (non-encrypted). If the connection is successful (i.e. 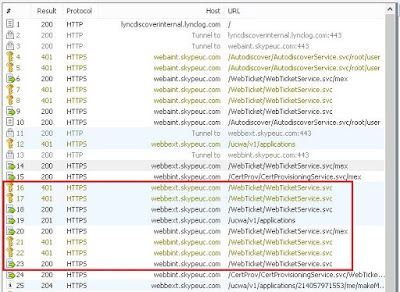 the target listens on port 80), the web site will respond with redirect to https://lyncdscoverinternal.contoso.com where the client receives XML containing the web URL where the client should go to authenticate and receive the web ticket. Desktop client will fail back and attempt to use SRV records (_sipinternaltls._tcp.contoso.com, etc.). If SRV records are not present, client will attempt to resolve the host (A) record for sip.contoso.com. If this fails as well, the desktop client will not be able to sign in. Mobile client does not have fallback mechanism. If Lync autodoscover service is not available (either because of DNS resolution or unavailability of the service), the mobile client will fail to sign-in! If lyncdiscoverinternal is not resolvable, clients will try to resolve lyncdiscover. The above still apply. Simple URL and autodiscover services are pointed to (and served by) Pool1. The enterprise does not allow hairpining. Instead, an internal VIP's were created to act as Reverse Proxy for clients requests when on corporate Wi-Fi to the external pool web services. The VIPs use *.skypeuc.com (Wild Card) certificate. Mobile client queries DNS and resolves autodiscoverinternal.lynclog.com to internal IP address. The IP is a VIP of hardware load balancer serving Pool1. ***Note that now HTTPS is required and the URL is webaint.skypeuc.com (the internal VIP of Pool1). The endpoint follows the instructions, SSL connection is now terminated with *.skypeuc.com certificate and trust is established. 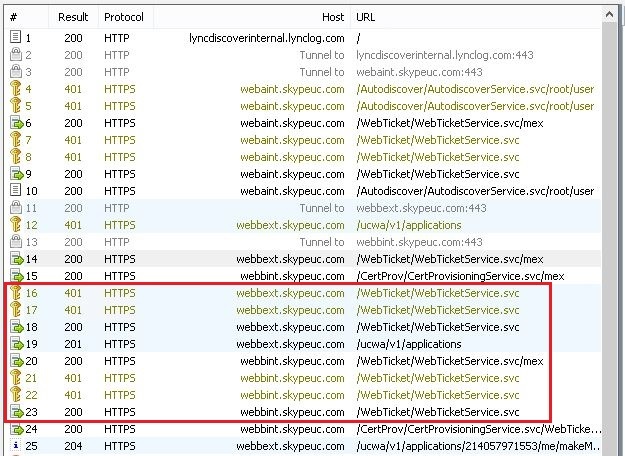 Endpoint attempts to receive WebTicket where it is challenged with NTLM authentication mechanism. After successful authentication, endpoint receives XML with service location. ***XML points to the user's home pool resources. Endpoint goes to Pool2 external web service FQDN and presents WebTicket. ***The device then connects to Exchange, but this is out of the current scope. ...and, at the end, presence information of user's contacts. The process of sign-in from public Internet is very similar, just (because we are coming from internet) no calls to internal resources are made. Haipining is a method for hosts on LAN to leave the perimeter via NAT (like it does to reach resources on internet), and make a U-turn to access enterprise resources exposed to Internet. To performs "hairpining", device with LAN IP 10.255.3.100 would leave the router with NATed IP of 71.14.14.42, make U-turn (not actually leave the infrastructure i.e. go to Internet) and visit 71.14.14.46. The response from the Reverse Proxy would get back to the device using the exact same path in opposite direction. The example above shows scenario where haipinning is not allowed in the enterprise. Instead, a VIP was created to act as Reverse Proxy for clients on corp Wi-Fi. The (internal, LAN) IP address of this VIP was entered in DNS as external web site IP address. If harpiniing was allowed, the A record (in LAN DNS) for webaext.skypeuc.com would have IP address of 71.14.14.46 (the public IP address of the Reverse Proxy). There is third method - one that bypasses the creation of "internal" reverse proxy VIP. Typical reverse proxy is "two legged" - an interface on LAN subnet (talking to the servers), and DMZ interface NATed to Public IP. The FQDN of the public web site could be entered on internal DNS with IP address - the IP of the DMZ IP address and of course, firewall configured accordingly. In this case, we "hairpin" to... DMZ. In both cases, traffic flows via the reverse proxy and "lands" on the external web site. In all three cases, mobile device will do signaling by via to the external web site. Hairpining is preferred method because it would resolve potential issues with cashing the IP address of the external web site and the transition between corporate Wi-Fi and Carrier network will be faster. When hairpinning is allowed, the administrator might elect to use lyncdiscover record in internal DNS. As we see in the Fiddler trace, the XML response with service locations contain pointers to both internal and external means of connectivity. Clients will select the one that applies to it. I am yet to see a good explanation when to use one or another. In case you wander where the traces come from - I used Fiddler as described in this article.